That it’s taken me this long to feature Shoreditch Grind is a little surprising, particularly as this was my fourth visit over the space of a year. However, as I explained to Alex, the manager, the first three were evening visits, when the low light levels made photography particularly challenging. This time, I made a very definite decision to arrive during daylight hours! Grind occupies a squat, two-storey cylindrical building. Downstairs, the front half sports three large, floor-to-ceiling windows. Inside, it’s one large, open space, the counter occupying Grind’s back third, in front of the curved, brick wall. There’s also a new extension at the back, off to the right, housing a smoothie bar. Come summer, this will allow takeaway customers and those sitting outside to be served without coming inside. An exposed staircase runs along the wall behind the counter, leading up to the toilets, kitchen and a recording studio. Yes, a recording studio. Doesn’t your coffee shop have one? The door’s opposite the counter, punctuating the middle of three windows and flanked by window-bars, further bars running the length of the other windows, seating provided by high bar-chairs. Six round, four-person tables, equipped a mix of bar chairs and stools, for two rows of three in the centre of the room. You can also sit outside (if you can stand the traffic thundering by on the roundabout). There’s a row of tables along the windows on the left-hand side, a bench either side of the door and a much larger, triangular seating area to the right, with about 15 tables ranging from two-seater round tables to long six-seaters. My first visit came late one evening a year ago. Walking past after a barista course, I decided it would be rude not to go in for a very fine (decaf) Espresso Martini and some extremely tasty toasted almonds. I returned in January this year for a lovely, smooth (decaf) flat white and some equally tasty olives (the toasted almonds having disappeared from the menu). Keen to try the decaf on its own, I followed this up with an espresso. Given how well it had gone in milk, this was surprisingly sharp, but not unpleasantly so, with an almost smoky aftertaste. For my next two visits, both in April, I was back on flat whites, made with the house-blend, a bold coffee, its fruity notes providing a counterpoint to the milk’s sweetness. On my most recent visit, purely for research purposes, I also tried the Rwandan single-origin espresso. This was fruity, but smooth, and extremely well-balanced. On the first of those visits, another evening affair, I tried the new (to me) Olivia pizza, an excellent thin-crust pizza with minimal toppings, just how I like them. On my return, I was finally able to sample the breakfast menu, deciding on the smashed avocado on toast, with, since this is me, a couple of poached eggs on top. Probably the best smashed avocado I’ve ever had, the avocado was really well mashed, the bread superbly toasted (it can get a little soggy if you’re not careful) and the eggs poached to perfection: solid whites, runny yokes. There were also small slices of red chilli: normally I don’t like things that are too hot, but this was perfectly balanced, enough to give it a kick, but not so much that it overpowered the taste buds. 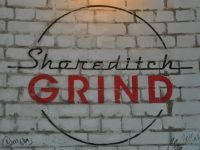 In closing, I leave you with one caveat: if you like quiet coffee shops, Shoreditch Grind’s probably not for you. Across all four visits, I’ve found it extremely loud and consistently busy. I love it, but be warned! Disclaimer: last year, Grind launched a bond to fund its current expansion. I invested in this bond, and, like all bond-holders, receive free coffee as a reward (although I still have to pay for my Espresso Martinis, olives, pizzas and smashed avocado). My decision to write about Shoreditch Grind was in no way influenced by my investment. This entry was posted in Bars, Breakfast, Cafes, Cake, Central London (East), Coffee Terraces, Dinner, Evening Opening, Laptop Friendly, Late Opening, Lunch, Sandwiches and tagged Grind, include, Small Batch by Brian Williams. Bookmark the permalink.